Optometrist in Vancouver | See for Life- Dr. Mini Randhawa, developmental, childrens' optometrist: Digital eye strain - who's at risk? DIGITAL EYE STRAIN – WHO’S AT RISK? Anyone in front of a digital screen is at risk, regardless of age, occupation or lifestyle. 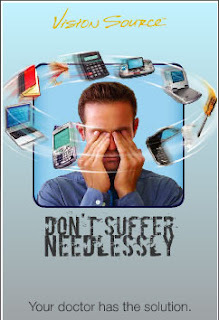 While certain factors can increase the possibility of digital eye strain symptoms, generally speaking, people who spend more than two hours a day on computers or other digital media devices should take a second look at their computer use, think about how their eyes and vision feel when using computers and other digital devices and think about taking steps to fight eye strain, visual fatigue and computer vision syndrome. People use digital devices for many hours every day for fun and for work. And both work and recreation are made more difficult, painful, uncomfortable and less enjoyable because of digital eye strain. Optometrists that treat this problem are often blessed with the reward of making an immediate, important and significantly positive impact on a patient’s daily life. Eye redness or irritation can result from staring at the bright backlight of screens for a long period of time. Dry eyes can be caused by the fact that we blink less when looking at digital screens. Dryness can also result from computer screens that are set at eye level. Blurred vision. This can be caused by screen glare and the right computer eye-wear can reduce it. The ill effects of glare increase with bright overhead lights, older computer monitors, dirty screens, and outside sun light entering the computer area. General visual fatigue is common when using digital devices, especially ones with small screens like iPhones because it results from straining to see small fonts and images. Properly prescribed computer frames and lenses can help significantly with this problem. Back pain and neck pain can occur because of poor body posture when a screen is not positioned properly. Many doctors prescribe computer eye-wear with a certain lens that will bring the computer image closer to the eyes and reduce bank and neck pain. Headaches can be caused by repeated eye strain. The easiest way to avoid this is the seek the right eye-wear from your doctor of optometry that are designed to fight eye strain and have lenses custom prescribed and designed for your digital behavior patterns and your eye and facial anatomy. Precision and accurate measurement is key. In a survey of nearly 10,000 adults, ages 18 and older, the Vision Council identified digital use trends trends by gender, age and lifestyle. Women are more likely than men to experience problems associated with digital eye strain. About one third of women report eye strain and neck and shoulder pain, and at least one in five women has suffered dry eyes (24 percent), blurred vision (22 percent) and headaches (23 percent). Men and women report similar use of digital media devices. Women are slightly higher consumers of smartphones, tablets and laptops, while men report higher regular use of desktop computers and video game systems. Gender doesn't appear to affect usage; men and women both average about four to six hours daily, and 10 percent of men and women report 12 or more hours daily of digital media use. Both men and women say recreation (e.g., video games, computer games and sport channels) is their primary reason for using digital media devices. Digital eye strain symptoms are common in adults under 55. But adults ages 45 and older are 14 percent to 23 percent less likely to experience headaches than are younger people. This may be due to the fact that people from different generations prefer different types of digital media . The most popular digital device for all ages is still television. Adults under 35 are more likely than other ages to use devices like laptops (76 percent), smartphones (66 percent), video games (49 percent) and tablets (30 percent). Individuals 55 and older are less likely than other ages to use laptops (52 percent), smartphones (22 percent), video games (10 percent) and tablets (20 percent). Regardless of age, the majority of adults use digital media four to six hours a day. For about 14 percent of young adults (ages 18-34), average usage is more than 12 hours daily. Recreation is the main reason for digital media use across age groups. However, mid-career adults (ages 35-55) report higher use for work and business-related reasons. blurred vision. The reason for this higher incidence of symptoms is pretty obvious - they spend more time than other groups working on digital devices. Among work-related digital devices users, more than 30 percent spend at least six hours a day, and 20 percent spend and incredible 10 to 12 hours a day working on a digital device. Read the entire report on digital eye strain here.